X-Men: Apocalypse wasn’t exactly the blockbuster hit fans of the series were expecting it to be. Though the movie continued the rebooted universe set in play by X-Men: Days of Future Past, the latest chapter in the franchise opened on a coveted Memorial Day weekend but put up weaker numbers ($65 million) than Days ($90.8M) or the juggernaut that was Deadpool ($132.4 million) earlier this year. But the quality of the film isn’t what has actress Rose McGowan up in arms. It’s the marketing. There is a major problem when the men and women at 20th Century Fox think casual violence against women is the way to market a film. There is no context in the ad, just a woman getting strangled. The fact that no one flagged this is offensive and frankly, stupid. The geniuses behind this, and I use that term lightly, need to take a long hard look at the mirror and see how they are contributing to society. Imagine if it were a black man being strangled by a white man, or a gay male being strangled by a hetero? The outcry would be enormous. So let’s right this wrong. 20th Century Fox, since you can’t manage to put any women directors on your slate for the next two years, how about you at least replace your ad? What is the context of the scene? This comes from the culminating battle, when Apocalypse and his Four Horsemen appear to have the upper hand on Mystique and her X-Men in training. 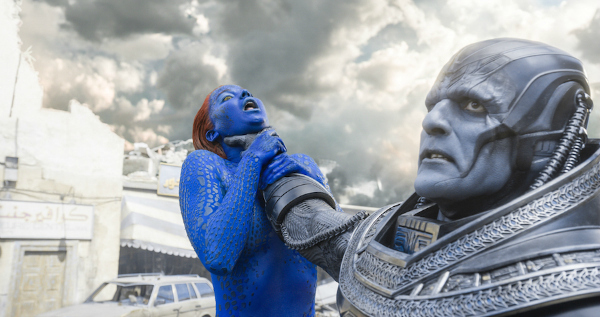 The villain grab Mystique by the throat. It’s a move that has been used in countless films, from superhero thrillers to standard dramas. Heck, Ghostbusters has a similar gag, where a possessed Melissa McCarthy grabs Kate McKinnon and dangles her out a window. But it’s not the focal point of an advertising campaign. Does that make it any better? Any worse? It's offensive in completely useless ways. Offensive isn't always necessarily bad, but this is offensive in ways that serve absolutely no purpose, and while it does depict a scene from the actual film, it's also a terrible representation of the movie as a whole. The Apocalypse/Mystique photo has been part of X-Men’s marketing campaign for some time. Now that Rose McGowan and like-minded people are voicing their concerns, what do you think of the ad? And what do you think, if anything, that the studio should do about it?